Ah winter. The holiday season. The perfect time for curling up on the couch with a piping hot cup of cocoa. My sister, brother and I have all been hanging out downstairs all day due to the pouring rain. 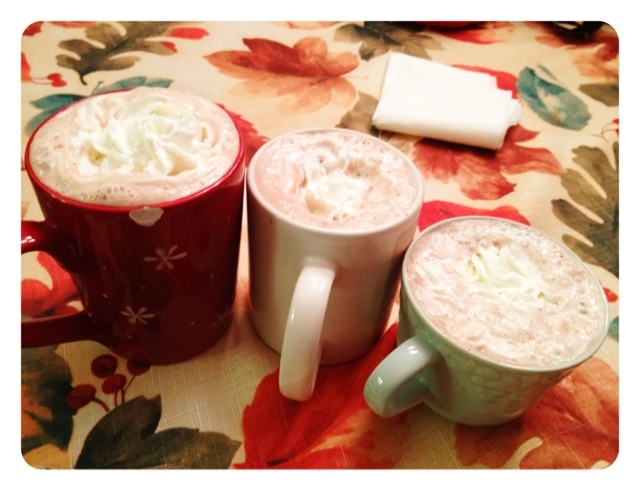 It got pretty chilly so they asked me to make them some hot chocolate. Heat up your milk in a saucepan on medium heat. Constantly mix the milk to avoid burning it. After the milk has a gentle boil add the packet of hot chocolate. Whisk in the powder. Add cinnamon and vanilla. After the cocoa is all mixed, take off the stove and let cool for a few minutes. Pour your cocoa into a mug and top with whipped cream. My sister said it was delish...I'd have to agree :] I hope you all enjoy the recipe!